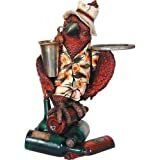 I don't know why, but I want a cool new Petey the Parrot Butler. This fun and festive tropical parrot holds a rimmed tray in its wings that's perfect for serving up drinks or snacks at your next party. Petey is made from durable sand-cast aluminum, hand-painted in a rainbow of colors on his body with a bronze beak, feet, and tray, and powder-coated for outdoor weather resistance. The good news is that he won't fly away with your drinks, but unfortunately doesn't speak.